When getting started in the sea of today’s websites, understanding how your site gets ranked can make all the difference. Google frequently alludes to the fact that they use over 200 different ranking signals in their search algorithm. Unfortunately, in order to prevent manipulation of search, these factors are a closely guarded secret. Websites claiming to have the full list of signals are nothing more than educated guesses, at best. Despite all the secrecy, there’s enough information available to gain a good understand of what works and what doesn’t. Whether it’s checking into Google’s patent filings, listening to Matt Cutt and the web team, or taking a scientific approach, a little detective work can help us get a clearer picture of what’s up Google’s sleeve. 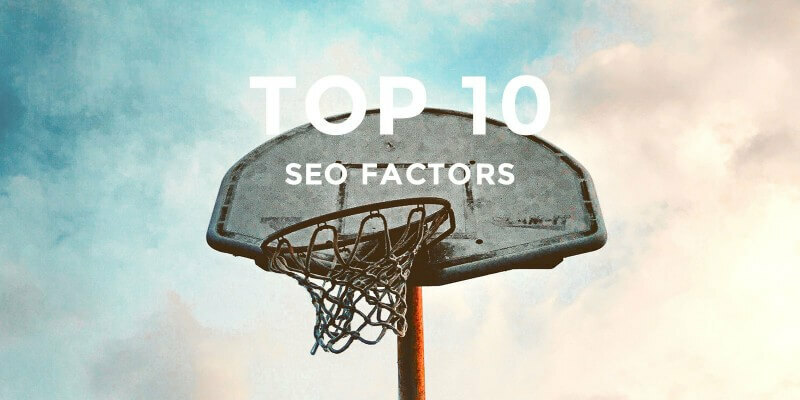 And without further ado, in no particular order of importance, here’s our take on the top 10 most important ranking factors for your new site that has been confirmed by Google. Largely regarded as one of the single most important factors to increasing your search ranking, high-quality backlinks have been proven to have a game-changing effect on your website. Back in March, Google surprised everyone by confirming backlinks as one of the most important signals for determining search rank. The phrase “content is king” couldn’t be truer. Also confirmed by Google, content stands alongside backlinks as one of the top ranking signals. Too many domain owners believe they can develop an eCommerce store or create a web presence with little to no content. A bare bone website won’t get you far in today’s digital age. Creating highly useful material for your visitors not only increases traffic but shows Google you’re a valuable site. Keywords are phrases or terms that searchers type into search engines when looking for something specific. We know that keywords play a heavy role in driving traffic to sites as otherwise searchers wouldn’t be able to find what they’re looking for. Having a keyword in your domain name, ALT tag, title tag, and bolded words have been confirmed to have a role in ranking. Likewise, keyword density, header tags, and keyword positioning most likely affect ranking as well. A seemingly forgotten factor, grammar does play a part in your search rank. Spelling and grammatical errors will negatively affect your site. Spun and poorly written content from article mills no longer cut it. Make sure that you fill your site with useful and well-written content, or hire a copywriter to do it for you. If your internet marketing company just uploaded your site and you can’t find it in search, fear not, as newer domains may not rank well at first. The age of your domain helps convey how “trustworthy” your site is, and plays a very small part in its ranking. Google likes security and they have flat out stated that they want all website owners to use the HTTPS protocol. In 2014, they stated this is only a lightweight signal, but they announced plans to crank up its importance as time goes forward. This is especially important if you plan on processing credit card payments. Make sure your eCommerce web developer offers SSL certificates as part of their package. As mobile search continues to overtake desktop, a website that performs well on mobile platforms is as important as ever. Mobile viewing compatibility has been confirmed by Google as a ranking signal. How many times have you clicked on a website link only to back out when it takes more than a second to load? Searchers demand fast loading times, and Google agrees. Optimize your site’s design and utilize Google’s page speed analyzer to determine if you’re up to speed. According to Google’s Ad Quality Rater guidelines, lack of contact information is reason enough to reduce a page’s quality rating, something that does influence your rankings. The guidelines also analyze the quality of the available contact information. This means that providing a verifiable address, phone number, and email may have more weight than just a simple contact plugin. Also in the quality document are guidelines for analyzing the author or website owner. Web owners should be able to demonstrate considerable expertise in their subject matter or have credentials that validate their knowledge. This is most notably important on YMYL pages. Although paying attention to these guidelines will set you on the right path, it’s important to understand that search engine optimization is an ever-changing game. Failure in staying up-to-date with current trends could set you up for costly mistakes down the road. By enlisting the services of an SEO company, you can help ensure your website remains on Google’s good side.